The literary mystery concludes in this issue, wrapping up another satisfying small-town miniseries. Dr. Harry doesn’t have to use his alien abilities to figure out who the real author-in-hiding is, or why the writer went underground for so long. He just has to ask the right questions and understand how difficult it can be for a woman to leave an abusive husband and survive as a single mother. 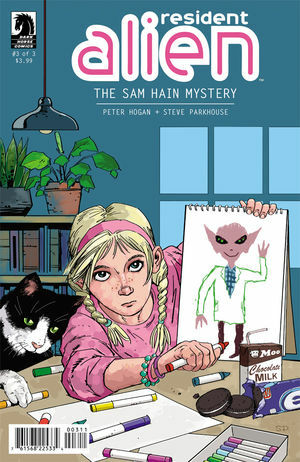 Writer Peter Hogan and artist Steve Parkhouse have come up with a terrific format for exploring the details of everyday life. Their protagonist, being from another planet and trying to blend in, has every excuse for being curious about the lives of his neighbors. I believe he gives off an air of difference that the characters unconsciously pick up on and so find him an open ear. He’s not one of them, not yet, so they can get past the expectations that comes with knowing someone for your entire life. And so we get to find out how people explain themselves. Because this is a retrospective mystery, with everything relevant having happened decades ago, it takes particular skill to keep the reader involved. Hogan and Parkhouse, through their fully fleshed profiles based on including just the right details, succeed. As we’re told the tale and caught up in the struggles of the participants, it becomes clear that memories, even past, shape what people become, even if they think they don’t. Update: The collected edition is now available. Yes it’s a nice series of minis, though Dark Horse chose to list the trade last month, before this finale coming out. We know how bad it can smell when studios try to bypass reviews, so I chose to bypass preordering. But it’s nice to know this third arc won’t rhyme with curd! And I’m sure its trade will be relisted in Previews at some point. I was interested in the non-spoilery description until it got to the part about “his obsession and heavy drinking”, which sounded too downbeat for me. I was thinking, actually, of Christie’s Elephants Can Remember, which is probably the one everyone knows. When the protagonist “profiles” the girl, he finds a new lead that becomes a potentially redeeming escape from his problems. So it’s an obsession to elucidate a decade-old mystery that would still have great import for various living folks, including the victim’s parents. Not unlike Robin Williams or André Franquin, Brown had had personal issues of odd jobs, divorce, drinking, and depression. (Which is probably why he’s more popular for his hilarious sci-fi comedies such as MARTIANS GO HOME.) If it’s somewhat downbeat, that’s from issues he had already fought himself.